Friend says "Stock market will crash, invest in silver" - thoughts? Re: Friend says "Stock market will crash, invest in silver" - thoughts? Where does his expertise come from? What degrees does he have, from which universities? You can have all the finance degrees in the world, forecasting the market is one area where education makes no difference at all. If you want to be a good long term investor you cannot listen to this stuff. We've been hearing about the coming crash for the past 3 years... Your friend is correct, as is everyone that says there will be a crash, but so what. The predictions of a crash are far more common than the actual crashes. If your allocations are right, you should not get excited about downturns any more than you should get excited about hot market runs. Timing hurts performance. Getting it right once (luck) won't overcome the long term loss of returns. You cannot avoid all downturns. Can you avoid some? In order to do that you have to get out of the market far more frequently than significant downturns will actually occur. When do you get back in? Nope, it's a losers game. If you are really worried, it probably means you are inexperienced and too high in stock risk exposure. Last edited by pkcrafter on Wed May 16, 2018 11:28 am, edited 1 time in total. A highly respected friend of mine is an expert in macroeconomics, and warned me to stay away from stocks. He advised shifting my investments to silver. Obviously nobody knows what's happening next, and there are lots of predictions of poor game in the future. Does anyone know what he is referring to? Yes, you should listen to your friend and bet your farm on it. Then tell us how it goes. Sometimes people learn things the hard way. Reminds me of a bit from Family Guy, "According to my uncle, who's a real whiz with volcanoes, A VOLCANO IS HEADED THIS WAY!" which was used by a huckster to sell worthless volcano insurance. He'll be right eventually. But that is not helpful long term. I thought for sure a crash would happen in August 2014, after I moved some Roth money into investments... it hasn't. Yesterday (5/15) I bought VTI (Total US - ETF). I had a limit order set for $140, but the fund was up early on and didn't fall to $140. So, despite all wisdom, I changed the limit order to 139.5, price fell and it executed. I timed that crash really well. true story. If a market crash is really coming and your friend knows it, I'd ask why they haven't leveraged everything into either options that bet on the crash or simply maxing out their credit cards to lend themselves money in order to short sell the market. Otherwise, ignore and stick to your investment plan. My policy was always to buy whenever I had spare money available to buy. Absolutely. Nobody likes short term steep drops. I'm used to them but I don't crack champagne when I lose 10%+ over a relatively short period of time. But I always revert back to the same thought... "will markets be higher than they are today in 8-12 years? If so, does having a bunch of cash piled up help me in any way to reach my goals?". That always puts it in perspective for me. I have 8-12 years left before I hit my number and re-balance towards less risk, take a deep breath, and begin a new chapter in my life. Being completely honest, I actually hope the next correction or pullback or crash or whatever you want to call it happens sooner rather than later. Not that what I think means a damn thing but as my time scales keep shortening, I'm starting to see the finish line more clearly. I can deal with a last minute setback but nobody can blame me for rooting to finish strong towards the end of my aggressive growth period. I'm 100% in it to win it and that requires being 100% invested 100% of the time. About 5 years ago I was on the stacking silver as an investment wagon, because I didn't know any better. Now I just buy the occasional collectible coin because I view it as almost a hobby. Not looking to "make money" off of it, nor is it likely that would even be possible. In the end, you have a bunch of coins that are sometimes fun to look at, but not exactly easily monetized. If you really wanted to invest in gold or silver, there are better ways than taking possession of the physical metal. "A courageous teacher, failure is." I think this forum is a bit obsessed with the idea that investment is stock index + bond index. Any contrary idea suggesting physical assets such as property and gold as diversification and hedge is looked down upon - just like real estate forums where stock investment may be looked down - having all categories will balance you portfolio. Not completely true...I DID ask about possibly investing in Real Estate as a choice, even (gulp) investing some in cash. Others here do invest in the permanent portfolio where one holds 25% in gold. And you should hope it doesn't go well. You stand to lose much more in the long run if you are right this time and start thinking you or your friend knows what you're doing. How very true! Reminds me of a lady I know. She won a good amount of money the first time she walked into a casino. Her comment was, "Hey, this is easy money!" She became addicted and eventually lost her house, her husband, her children, and every dime she owned before she got help. Even decades later she says her heart still races when she sees the lights or hears the sounds of a casino floor. She would have been far better off if she had lost all of that first $25! It seems to me all those silver commercials started about the day after gold tanked. His friend is a pension fund manager, very knowledgeable about the stock market. Yes I'm being serious that is really who his friend is. He said that come October or March next year, there are likely to be big crashes. Could you ask your friend to narrow it down a bit? Is it October or March? And which date, specifically. I promise to respect him more (and to bookmark this thread) if your friend comes up with a real date. An how big are these crashes going to be? Big? Or BIG? Has your friend already shifted all of his investments? Is he offering to put you in contact with his (equally respected and equally expert I'm sure) friend who will be happy to sell you this silver? Is your friend named Michel de Nostredame by any chance? All you Bogleheads gonna be sorry you didn't buy silver when faced with the werewolf apocalypse. according to this chart the price of silver seems to drop everytime there's a recession (and even when there isn't one, like the last several years). How exactly is silver going to help you then? 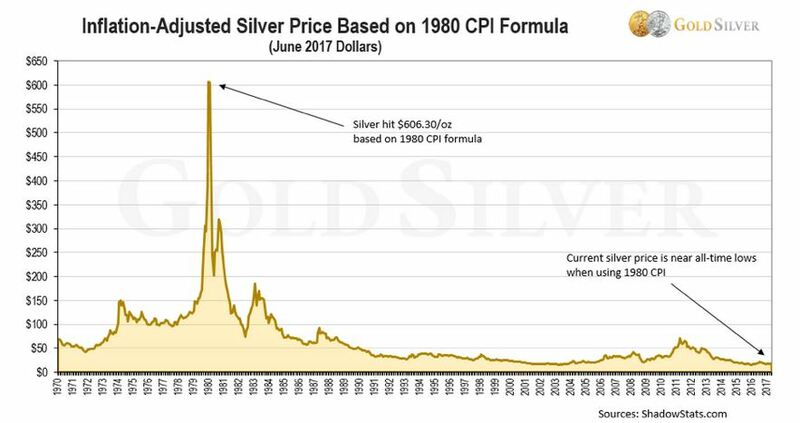 This is the inflation adjusted value of Silver since 1970. Does this look like something you want to invest in? Is your friend one of the Hunt brothers? and rebalance. I have rolls of silver in a safe but it's not an investment, it's insurance. SmilerUK - Did we answer your question? To our experienced members, please state your concerns in a civil, factual manner. That is the CPI-adjusted price of silver on a Log Scale. The spot price reached about $35 in the beginning of 1980 which is about 112 in today's dollars. The second chart is totally wrong. It adjusts using a bogus measure of inflation. See the source link. One good rule about investing in precious metals is to never tell anyone you are doing it. The problem is that if word gets out that you are committed to precious metals then that could cause people to show up at your house and demand that you open your safe and give it to them. If you can't give it to them give it to them because the gold or silver investment is on paper then things could be awkward. October or March? But not November or April? AArgh! I was wrong! I bought silver too early! This investing stuff is HARD. I had no idea I'd have to have a working crystal ball to do it. Yet I've somehow reached my investing goals anyway, like many on this forum. You might try tasking them how they did it despite not having a working crystal ball. I'll give you a hint- we've recognized that while we don't have a working crystal ball, neither does anyone else, including your highly respected friend who happens to be a macroeconomic expert. Ignore the noise. Write down a reasonable long term plan (it can even include a little slice of silver if you want) and follow it for a few decades. OP, serious question...Why does your friend suggest silver? Why not Real Estate? Gold? Treasuries? Money Market? What does he see that we do not? He talked about its usefulness and demand for it, versus the lesser demand for gold in practical terms. That's classic: ". . . friend of mine is an expert in . . ." No offense, but it's like the beginning of an urban legend. These "experts" are everywhere. I just watched a YouTube of Peter Schiff, one of the biggest blowhards in the business, in 2012 telling people, in the shrillist of terms, to buy silver!!!!!! It was around $30 then. No doubt he's got plenty of expert explanation today as to why people that followed his advice have lost 50%. Peter Schiff knows a lot about macroeconomics. But most of what he knows is simply wrong. You'll find that there are many people out there like this. As Friedman said about the North Koreans last night on CNN, "this carpet has been sold before." Don't believe it. If you sell all your stocks and buy silver, you'll have a lot more to worry about. You're absolutely spot on. Thank you for reeling me in. Everyone who accurately predicted the last stock market crash and were able to properly execute trades to take advantage of it became multimillionaires. If your friend is not already fabulously wealthy, he is about to become so. I recommend you become closer to him. The one who accurately predicted the last stock market crash and were able to properly execute trades to take advantage of it became multimillionaires, if not billionaires. They are now off on their own private island laughing at the rest of us. Did your friend give you this advice on his island? Was it nice? or is he still a working stiff like the rest of us? In fairness to him, he is extremely well-off financially. I am worth multiples of millions, he is ten times that. Don't think he has an island tho. The only person who gets hurt on a roller coaster is the one who jumps off. That is a GENIUS quote! Your friend is probably right about companies being leveraged. What is hard to predict is when and what is the tipping point. So they are likely to collapse at some point? Or just dip? Gold is better than silver. Gold has zero to negative correlation with stocks. Just curious, how is gold that different from silver? They're both precious metals, neither produces any real return. Why is gold so much "better" than silver? Gold is a much scarcer metal than silver and thus has much lower storage costs. When rulers have tried to devalue the currency they have typically done it via silver coinage, not gold (one of Diocletian or Constantine's reforms ((?) was to abolish silver currency, it had become so degraded, and replace it with the gold solidus). There's a lot more silver available e.g. in decorative uses, and so when the price of silver goes up, a much bigger supply of the metal comes into the market. There is talk of this long term historic ratio of gold price to silver price (25 to 1?) but in fact it's been such an unstable ratio that I don't think there is much conviction (except among silver bugs) that it will return to that "equilibrium"). Would you think it's worth BUYING gold and/or silver therefore as a form of insurance against stock market devaluations? What about November through February? We'll be ok then? Any respected macroeconomic expert should be advising you to put your life savings into bitcoin, not silver. That was the second part of the conversation. Yes -- very clearly. I love it. Nobody knows nothing, including your friend. IF stocks show a decline within his timeftame it is simply a coincidence. Fools think their own way is right, but the wise listen to others. Old actors, with have careers that have long passed them by, advertise for gold and silver on cable TV in the wee hours of the night. That is all I need to know about gold and silver. Gold and silver are in the same class as the "Thigh Master"..... which made Suzanne Somers rich but I doubt it did anything for people's thighs. I'm reminded of the old joke- "He has successfully predicted 10 of the last 5 market crashes..."
Silver no because it's a "precious metal" but with its own complications. And it's not as fundamentally scarce as gold. Gold. There's a William Bernstein essay on Efficient Frontier something like "the most patient asset" is the title. And the answer is that gold really is a long term bet. It appears that gold (not so much gold mining stocks) really does have a negative correlation with markets. The downside is that its expected return is actually negative or nearly so-- the historic data is very messy, but fundamentally what you have is a pile of metal with a storage cost. So putting gold in your portfolio lowers your expected return. 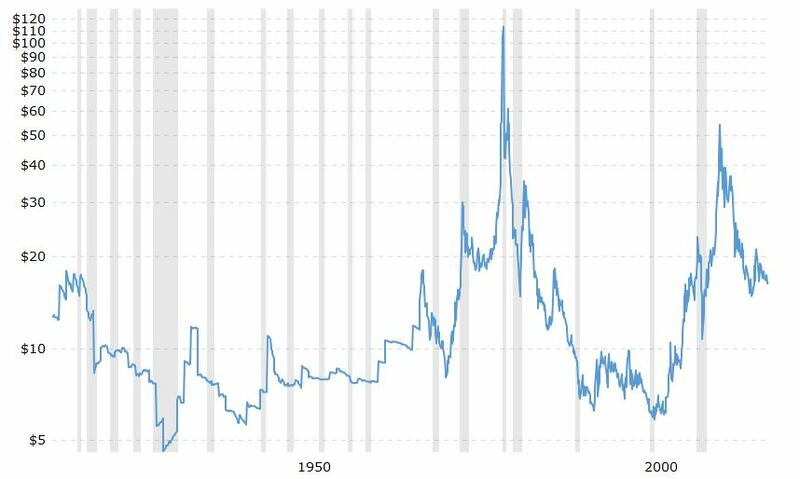 However in periods of extreme market downturns, it might be valuable insurance-- I am thinking a rerun of the 1970s with commodity price shocks and high inflation, for example. I do not hold gold, and am happy that inflation-linked bonds (TIPS for Americans) offer sufficient hedging prospects. Usually the gold fans (like the crypto currency fans) only appear here when the price of gold is *up*. Performance chasing. The time to buy gold is when it is *down* and usually that means financial markets are overly complacent. Is it possible he's referring to a new job he has selling investments in silver? Than my hat is off to both of you, I'm still in single digits on my two comma club membership. 5 or 6 years ago, give or take, this guy I know was saying buy silver and sell stocks. Silver was at $40 and the market was half of what it is now. There will always be people saying stuff like this. Occasionally they turn out right, but most of the time they are wrong. Since you have been successful to date making or managing millions, why take the casual advice of a friend when you know what it takes? Silver costs much more as a percentage than gold to both buy and sell. I still have some silver coins I'd love to unload. Worst investment ever. If I took that money 5 years ago and put it under the mattress, I'd be better off today than I am with this stupid pile of silver coins. Ask him for his home address… mostly kidding. Precious metal will always have their appeal. I'm currently 5% allocation for gold myself. I might increase it to 10% if I was feeling particularly bearish about the economy. Main issues is security and relatively high transaction costs. The volatility can be an issue for some, not for me. Look up “stacking silver” or “stacking gold” on Youtube to view the gold-bug subculture in their own words. It's weirdly fascinating. I have a degree in Economics and I was taught by many decorated Doctors of Economics. None of them were particularly wealthy.